WHAT WE FILIPINOS SHOULD KNOW: Just received a friend's email of an interview with Rick Warren, author of the recently released bestseller book entitled "Purpose-Driven Life." Anyway, Rick stated the usual "... life is preparation for eternity. We were made to last forever, and God wants us to be with Him in Heaven" etc.. and....".If you focus on your problems, you're going into self-centered-ness; which is my problem, my issues, my pain....and "But one of the easiest ways to get rid of pain is to get your focus off yourself and onto God and others. "Frankly, if I were a self-proclaimed Christian, it would behoove me to take care of myself, so as not to be a burden to anyone and thus be able, with the best effort and/or power I can have, to focus on others. I would not focus on God nor be expected to because I do not see God as selfishly desperate for my(our) attention; God is not KSP "kulang sa pansin" as some of us are. I would be honoring God by acting for the good of others, in my surroundings, my community, my homeland. That is what I expect of so-called Christians in our homeland, whether of the Catholic or the Praise-The-Lord variety. It is with such thoughts that I rewrite and re-post about our religion and our peculiar Filipino norm of Christian morality. Our homeland, the Philippines, is recognized as the only Christian country in Asia. However, whether we Filipino Christians can claim to be truly following, imitating Jesus Christ and living as "good Christians" is arguable. (Am not covering Muslims here). Functionally speaking, religion is supposed to give meaning to one's life and to be a source of moral/ethical behavior, in the personal and social (socioeconomic and political) areas. Unfortunately, it seems that we Filipino Christians in the Philippines and abroad can not claim to be really leading such expected Christian lives -most especially with regard to ethical behavior in our homeland's sociopolitical arena (government, business and military) as exemplified in rampant corruption, killings of journalists and activists, etc. Filipino Catholics are a majority, but unfortunately, as such we generally do not seem to think and behave as truly good Christians in Philippine society. Filipino Catholics tend to focus on pure religiosity, to be mainly observants of Catholic religious rites and church-made rules, to overspiritualize despite the Second Vatican Council's (1962-1965) agenda of "aggiornamento," of the church "bringing up-to-date;" that is, of encouraging Catholics to attend more to social concerns, of applying righteousness in the treatment of the poor and most vulnerable in our society. To date we so-called Christians in the Philippines still practice, knowingly or unknowingly, "split-level" Christianity. When we or someone err, we dismiss it by easy escape clauses such as "we're only human," or " whoever has not sinned cast the first stone," or "it's hard to be an authentic Christian," I say you bet. So let those among us who are self-proclaimed Christians ask themselves, why proclaim, if we can not live it or even try to emulate the life of Jesus Christ? Maybe Christianity is just a social club we joined without understanding its humanist mission. Sure, the rites and church-made rules underwent changes, for example, how the Mass is performed; or when to observe Friday abstinence. But these are all mainly symbols of Catholicism and are externalities. Greatly missing in our Catholic Christianity are changes that define attitudes and behaviors as they might impact and shape how we, its members -the clergy and laity- engage in the world [i.e.Philippine society] or how to put our Christian faith to work in improving ourselves and society. Our present and urgent need is: Social action rather than purely selfish, self-centered, personal piety for social transformation. I think and believe that social concerns and actions are more relevant and much more important to our homeland's present predicament versus that when one's Christian practices emphasize only the attainment of great personal piety and/or following church-made rules. One Catholic Christian teaching which seems to continually and negatively impact Philippine society is the pronouncement of the Beatitudes that says "How blest are the poor...those who hunger and thirst for justice...Be glad and rejoice, for your reward is great in heaven." By repeatedly stating such, the impoverished Catholic Filipinos are made complacent and content, discouraged to fight for even a "small place under the sun", that is, for decent living beyond their mere existence and survival. Such teaching that emphasizes other-worldliness is to disregard and exhibit callousness towards the present hell of the poor. It is the major reason why Karl Marx more than a century-and-a half ago has stated that ".....religion is the opium of the people." I think and believe that the Catholic Church [the catholic hierarchy, its bishops, priests and active laity] should stop this kind of preaching and thinking. The same can be said of mainline Protestants and evangelicals/fundamentalist varieties. The latter concentrate and devote their attention on the Bible, give themselves to its literal interpretations, and thus wittingly or unwittingly, make a book, the object of their idolatry [do they realize this?]. By stressing that personal salvation is only between himself and his God, the fundamentalists practice detached or escapist pietism, and generally tend to withdraw from involvement in sociopolitical activism in society [recently a few of its ministers ran for political office, which I think should not be entered into by church people].They withdraw into detached pietism because their Bible says "enough of worrying about tomorrow and let tomorrow take care of itself. (Matthew 6:31-34)"
These words of contentment are great to hear and read if one is a member of the ruling class or the fortunate few who have money to afford conspicuous consumption, convenience, luxury et al., and thus be able to go on with one's merry ways. For them to proclaim or imply that the impoverished should not worry about his food for tomorrow, about his child's need for unaffordable medicine, to pursue his child's education, or his grandchild's future, etc. is by default to be in cohorts with the selfish among the ruling elite and their foreign partners (TNCs) who want to perpetuate ignorance and therefore exploitation of the impoverished majority. By indirectly supporting the oppressors, they become evil and "bad"Christians themselves. Two centuries ago, Jean Jacques Rousseau wrote with obvious contempt: "True Christians are made to be slaves, and they know it, and do not much mind; this short life counts for too little in their eyes." I think and believe Filipino Christians, Catholic and Protestant, should do more than attend to their churches as institutions; they should do more than proselytize; they should do more than daily pray and praise the Lord (is the Lord that insecure and thus need constant laudatory attention? ). It is time for Christians to actively work to change Philippine governance, to make and pressure the government to be truly responsive to its suffering citizens, i.e. help free them from extreme poverty which consequently robs them of their human dignity. Christians should make their religious faith alive by not wasting time on, but discarding instead, their old-Reformation debate about "scripture or tradition" and instead work together to create a Filipino society that will materially and decently sustain the majority, if not all, of Filipinos and thus accord them with dignity and destiny as persons. Whenever we Filipinos gather and talk among ourselves, we all agree and lament about the sorry state of our homeland and our fellow countrymen. We fail to realize that we ourselves can do something, more than just being observers --if you can use the computer and access the internet, you can do "something". Specifically, we can contribute and/or work to educate or "conscienticize" (ourselves and) the impoverished, i.e. 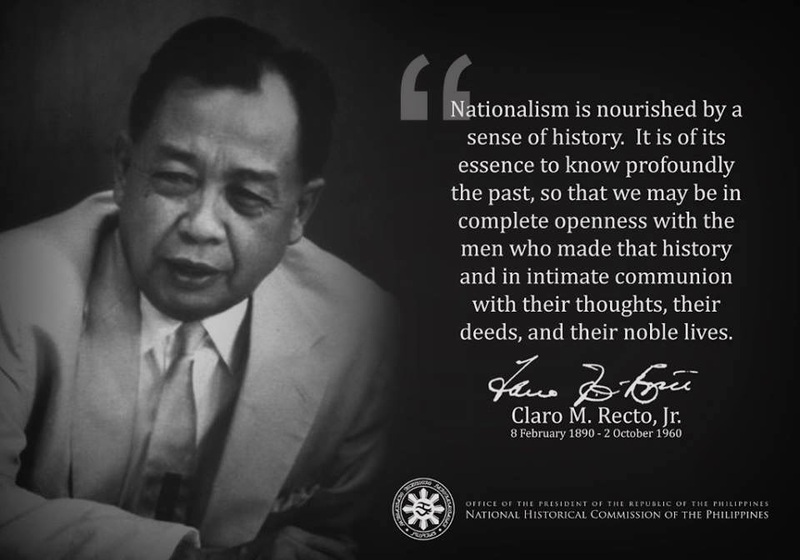 to raise our social consciousness, thus understand the social institutions, economic and political systems that oppress them; to enable them to do critical thinking as they interact in society with the sources of their oppression and to make them aware that they are important and of equal worth as persons [served well by the Basic Christian Communities during the martial law years]. All Filipino Christians should seek to understand their religious beliefs/religion, to go beyond the preaching of their pastors or priests and ministers, to give but at the same time not be content with charity (which may sometimes only foster dependency on the recipient and breed arrogance on the giver), and to work to improve Philippine society, to reform it and if necessary, to revolt against their oppressors because society, more specifically - its state or government, is ultimately responsible for promoting the common good of its native citizenry. The Reverend Nathan Day Wilson will deliver the 2006 Rockefeller Lecture on Youth, Culture and Religion. The title of his lecture is "Caught and Taught: The Art of Generating Faith with Older Adolescents." "Nathan is relentlessly curious and an engaging speaker," said Dr. Benjamin Woods, the Dottie M. Rae Chair of Classics. This is a great article Bert! I have given up catholism has a whole and merely practice the thought that there is a heavenly being but not one made by man. Filipinos do almost as if they were mechanical drones in a Star Wars movie worshipping Darth Vader or Yoda. possibilities of a church tax! So many poor people go to the church and I know they give their money to the church but what has the church done for the country except send their money to the Vatican for their monthly contributions? Subalit marami sa mga TAO ang hindi tumugon na maging kawangis ng Diyos sa halip ay nilandas, tinahak at isinabuhay nito ang kaisipang alipin at panginuon na nagbunga ng masalimuot na kasiphayuan, kahirapang, pagsasamantala sa lahat ng antas ng buhay pisikal at pangkaisipan. taliwas sa landas na nais ng Diyos na landasin at isabuhay ng mga TAO. Salamat din kaigigang Bert, Ang pagpapala at gabay ng Diyos na iyong wangis ay ay laging sumaiyo sa lahat ng antas ng pisikal at pangkaispa sa buhay, pamumuhay at pakikipamuhay. I understand your stance. I wrote the piece not because I suspect a deliberate ploy of the church to fool the people/faithful as a few or some of the Spanish friars seem to have done so in our history. I suspect many in the clergy, then and now, do not have a well thought out or critical understanding of their religion themselves. As to taxing the church, the Constitution may have to be amended in that respect. But I appreciate the fact that the Church does not get any state support. I also recognize that it has done positive contributions to our society. As to church influences, positive and negative, more education (with critical thinking) among the majority is needed; this goes true also in other national issues,i.e.socioeconomic and political, which I continually write about. Proponents of Christianity, whether they be catholic or protestants can reduce "What it means to follow Christ" into some kind of formula. Yet the ultimate need is to cope with the ever increasing incapacity to answer the basic questions which everybody asks but not everybody admits they are asking, "Who Am I? What am I here for?" To become a Christian is to follow Christ, and to follow Christ is, Yes, not merely doing the rituals of religion. Christ was not merely compassionate, he did something about the plight of those people he felt for. He was not aiming to lead a Kingdom but his intention was to transform every man from within so that each will enjoy a Full life. He said, I have come to give you abundant life (JOHN 10:10, and this is a profound vision for every one of his creation. Hopefully, as people are truly hearing His words and coming to him by faith, and not merely echoing God's word in their rhetoric so they can appear good and charitable, they would realize that the only true motive in serving even the common good is "LOVE". Unless a person becomes a true Christian, this is not going to be easy to follow. Nobody, who merely uses his human faculties and resources, even the most noble, can last loving his neighbor without wanting something in return. And even as we demand that those in power or those who are claiming to be religious authorites should spread some kind of a more active Christian response to the problems of our nation, we realize that only a kingdom outside of this world will enjoy such a balanced state of things. We cannot discount the value of a personal relationship with Christ. For every true Christian, a revolution from within is happening and since God honors our spaces and our weaknesses, we understand that everything, however slow, is at the works, and we can't be too cynical.